Simon Evans’ and David Aula’s meta-magic show has been knocking around for a couple of years now. There’s even a sequel, The Extinction Event, also at the fringe. It’s easy to see its appeal. It’s a smart, slick fusion of sleight of hand and storytelling coupled with an exploration of the psychological appeal of magic: the comfort that can be taken from seeing lost things restored, broken things made whole. Evans and Aula tell the story of Hugo Cedar, an Edwardian magician who performed the ultimate trick – he made himself vanish and was never seen again. Using complex and well-orchestrated audience interaction, they fuse this story with their own story as magicians, with Aula becoming increasingly obsessed with Cedar and his mythology. Though sightline issues in the room undermine the impact of some of the tricks, the structural complexity of the show is impressive. 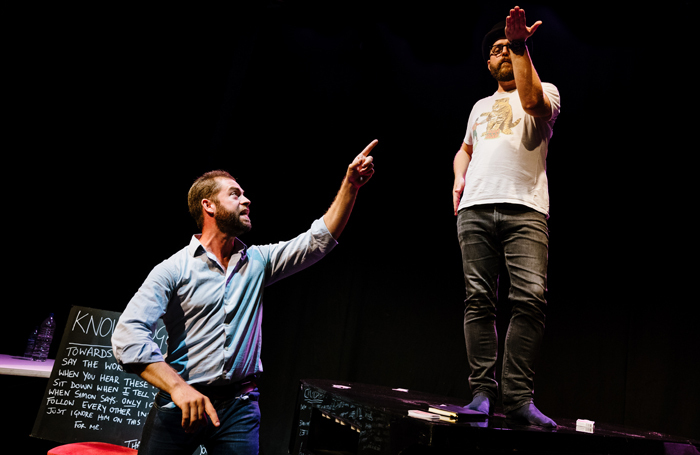 Gradually the show morphs into a discussion of the intricate mixture of belief and disbelief that watching a magic show requires of its audience, the hope and wonder embedded in illusion. Evans and Aula have flair as a double act, they’re energetic, excitable. There are a couple of moments that could be tighter – this kind of performance relies on precision – but this is a taut, smart, satisfying show.